If there is ever a nuclear power plant disaster or meltdown in the United States, the following map of their locations compared with a live wind flow map (direction and relative strength) will enable you to quickly determine your downwind risk from radioactive fallout effects. or click on a spot for wind location detail, or click and drag to other areas. 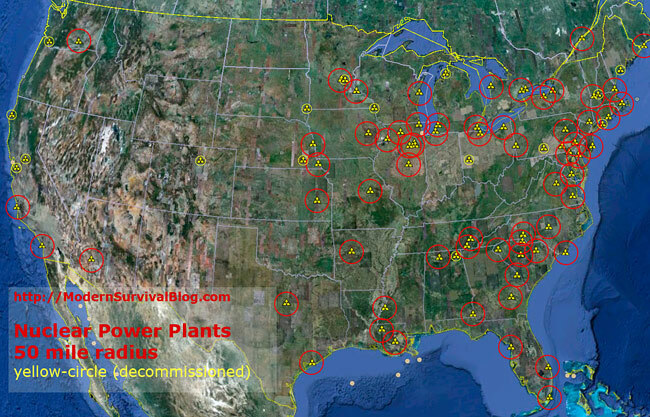 The map shown above illustrates the location of all the operating nuclear power plants in the United States (I believe there are 104), and I have added a 50 mile radius (100 mile diameter) circle around each one. I’ve chosen a 50-mile radius as a distance factor, given that generally any radioactive fallout will dissipate according to the inverse-square-law. A key factor though are the wind patterns which WILL affect the distribution, which is why I’ve also embedded a live wind map of the United States. That said, IF fallout gets into the upper atmosphere (e.g. major explosion) then the radioactive particles will begin to distribute widely and will follow upper level wind patterns. I am somewhat shocked at how many plants there are. that live flow map is a nifty feature to check drift etc..
Is that flow map a generalised wind flow patterns (are they consistent?)? wondering, I suppose major storms would affect the flow etc? also thinking this type of flow map info is good to have for many other situations.. The wind map is indeed ‘live’ and reflects the current wind patterns as they are occurring in real time. As visually stimulating and interesting eye candy as the live map appears, I have some reservations as to the level of accuracy if a real nuclear event or series of events were to occur. One would expect some major changes regular natural weather patterns if a disaster were large enough, God forbid there were more than one. Hmmmm Maybe you should post a better map then. Others are stating the same thing. It’s a good map and just not the map is all. Good find all the same. The point of the map,and of the site in general is to provoke thought and discussion. Ken goes to a lot of effort to make this happen. Of course no map would show you everything as we don’t have any idea really of what would happen if there was a meltdown war,famine ect. Or it could be something no one has even conceived yet that will bring on TEOTWAEKI. My point was if you want to say the map doesn’t meet your standard then post one that does. Like this map . Have a question though , do you think that maybe fallout radiation will travel farther , than the area you have highlighted , and could it be stronger if the winds at the time are faster ? I would think so , I am east of the port Gibson reactor that is on the Mississippi River , just concerned . Be prepared and ready . Keep your powder dry . All fallout is not created equally. Without some kind of massive explosion the really dangerous radioactive material will remain in the reactor. If there is a steam explosion or even a intentional explosion by bombs. The most radioactive component tends to fall pretty close to the source. If you are a mile from a nuclear plant it is unlikely that any “serious” fallout will reach you. Fallout is also interesting in that the most dangerous fallout is also the most short lived. The reason is obvious, the thing that makes it dangerous is it is spewing radiation. The thing that makes it short lived is in a few weeks most of the ability to radiate is gone. The problem with assessing danger from nuclear fallout is that we can detect very minute amounts easily. Most people make the mistake of translating a report of increased radiation (above background radiation) as an indication it is unsafe. It is not a doubling of the radiation is virtually meaningless as would be a quadrupling etc. In fact you need to have levels a thousand times greater than background radiation to create any meaningful results. In this world today the group of people who willingly expose themselves to radiation wildly in excess of normal background radiation or pilots, stewardesses, mountain climbers, frequent flyers, and people who live in Denver or any city that high in altitude. There risk is 10,000,000 times the risk of living downwind from a nuclear power plant. There have been 7 deaths in the U.S. attribtable to nuclear power. There have been tens of thousands perhaps millions of deaths attributable to coal, oil, NG and hydro power. Yet we obsess over nuclear. Probably if a power plant is going to kill you it will be at the end of the 110 volt AC line in your home or a faulty gas heater. You have a much better chance of winning the lottery 10 times in a row. gonewiththewind, when you say 7 deaths attributable to nuclear power, I assume you mean commercial nuclear power plants, the ones that make electricity. I would be interested to know which plants these deaths took place at, and the causes. I know of a few deaths due to natural causes, or in the case of Arkansas Nuclear One, when the rigging failed on a heavy component. But deaths due to the nuclear side of the plant? I can remember one incident I read about in Idaho. It was a military reactor, 60’s 70’s and three enlisted were on a night shift and were simply supposed to be babysitting it. They were clearly moving or removing some of the uranium tubes or control rods and caused a steam explosion. All three were killed by the explosion and shrapnel and there was no meltdown or reactor failure. I don’t have a source for the others. I’m thinking it could have been the sodium cooled nuclear reactor near Detroit many years ago. I have read the book “The night we almost lost Detroit”. I am recalling all this from over 30 years ago so references are non-existant. can we get this map with a layover that includes cities / state borders / highways and maybe topography such as hills and valleys? Although ‘Gonewiththewind’s comments are somewhat comforting, I think a grid down situation, be it from terrorism, a CME or EMP creates a terrifying situation. 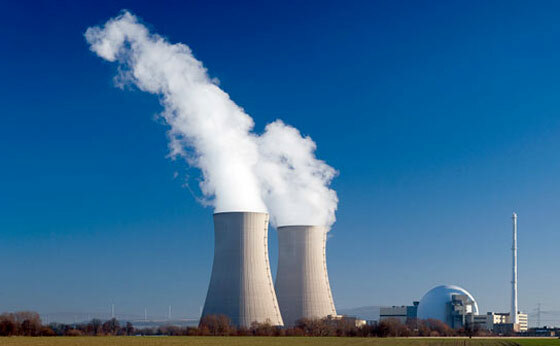 From what I have read, our nuclear reactors are not hardened and rely on backup diesel generators for cooling, which only have the ability to run 4-14 days, after which wold likely lead to meltdown. Looking at the map above, not many people on the heavily populated East Coast would survive. (consider the panic and chaos of such an event) I don’t think nuclear meltdown is factored into the governments published survival statistics for an EMP, which is 10% survival 12-18 months thereafter. -The only survivors will be the government and the elite who have built massive bunkers for themselves…with our money. North Korea has blackmailed us for years with their false promise to not make nukes. Plus Russia is giving them materials to help build rockets that will travel further. Oh lets not forget that Bill Clinton gave them the tools/material/uranium/money to make nuclear plants under the false premise they would not use it for nuclear weapons.. Now that they are being confronted and we are not giving into their blackmail the big baby is making more noise for not getting his way. Unfortunately we can’t bankrupt America to keep this nut case happy, he has been appeased for too long. Wish there was another way but we may need to do something drastic to stop him from burning a hole in So. Korea and creating a huge amount of fallout to the entire world. Things will not be good if that happens but think about this, if he sends and EMP our way what do you think would happen to the US? Disaster, maybe even worse then a Nuke. No easy answer for this. Blame Trump but he didn’t create this mess, This lays in the hands of all those who were allowing the blackmail to continue all these years. Now it’s out of control. Wasted too much time playing games with a lunatic. See we’re all on here looking for the safest place we can get to because we know the evil is coming, and we can’t stop it, it was written in the Book and has to happen, the Lord has been patient enough, but in the end It is appointed unto man once to die and after that the judgement. No one can get to heaven because he’s a “good person” no one’s that good, but Jesus, He is. Jesus came and gave His very life so that we could receive Him as our Lord and Savior, if you Confess your sins to Him and ask Him for forgiveness he is faithful and just to forgive you your sins and to cleanse you from all unrighteousness. I hope you’ll do that today, and hey, I hope He’ll show you a great place to hide in the coming storm. May God be with you and your families. I agree this post is out of place. I do understand that you felt compelled to post as logical….When one addresses nuclear power and mis- haps that may or may not ever happen, each of us faces his or her own mortality. That said…There are many people who come together for preparedness tips on this board. Each one has a set of beliefs. THEY are all adults and can read and study religious material that is available for free., Many are fluent in more than one language. In posting this you are telling them that they have not made any progress toward obedience…YOU KNOW no ONe here. You should start your own blog and site to develop ,.. if you wish to push YOUR beliefs. also proof read your postings.